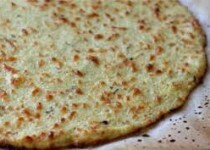 This cheesy, garlic cauliflower flat bread recipe couldn't be simpler and its gluten-free and low carb. 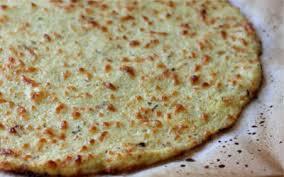 Can be use as a pizza crust or would be great served with soup in place of bread. 1) Preheat the oven to 450F. Wash the cauliflower and chop it roughly into florets. Add it to your food processor and pulse until it resembles couscous. 2) Place the pulsed cauliflower into a bowl and cover it with cling wrap. Microwave on high for 9 minutes. Remove the bowl from the microwave and add the rest of the ingredients (minus the cheese for the topping) to the bowl and mix well. 3) Line a baking tray with wax paper and grease it well. Pour the cauliflower mixture into the baking tray and shape it in a rectangular shape. Don't worry if the mixture looks very soggy or runny, it will firm up nicely in the oven. Bake it for 20 minutes or until crust is firm and golden brown.